907-745-0800 | Call now to preorder turfgrass sod! So you need some sod or have some questions… you’ve come to the right place! 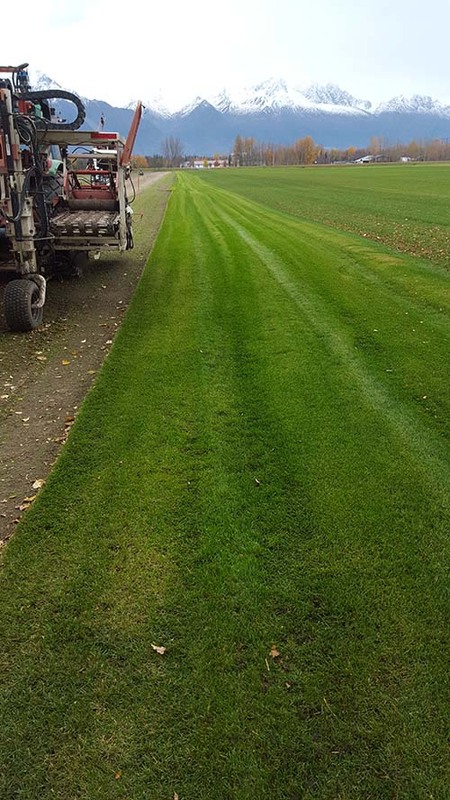 We grow and sell Nugget/Kenai Kentucky Bluegrass turf and are the leading producer of sod for Alaska. We produce sod in accordance with Turfgrass Producers International specifications. 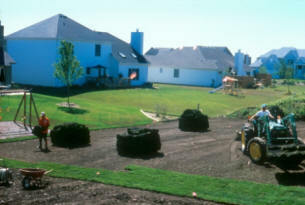 2′ x 5′ rolls – Nugget/Kenai Kentucky Bluegrass in an easy-to-handle size for lawn & landscaping. If you’re ready to order or have questions that you don’t find answered below, please give us a call at (907) 745-0800. For orders over 400 SF, small rolls are loaded onto pallets to make pickup/delivery easier and more efficient. You do not have to purchase full pallets: we price by the square foot, or by the roll. We are happy to load smaller orders onto your truck to avoid pallet returns. Each pallet of small rolls contains 400 to 700 SF (40 to 70 rolls), and weighs 2,000 – 3,500 lbs. per pallet. Pallets cost $30 each, to be refunded when returned in good condition. *Please return to Raspberry Rd. or Palmer locations for credit: call or leave a note with your name on the pallets. We try to meet all order requests, but please call ahead to order sod and to check that we have sod available. We request at least two days notice so that we can harvest your order and deliver it to your preferred pick-up location or your site. Sod is perishable, so we only stock as much as our customers need, and sometimes we sell out or may not be able to fill your entire order at the last minute. Please let us know how many square feet you need: we will provide enough rolls for that area, rounded to the next full roll. All delivery prices are determined by quantity and location: please contact us for a quote. Delivery is usually free for orders over 4,000 SF in the Anchorage, Eagle River, Palmer, or Wasilla areas. Statewide delivery can be arranged on request. 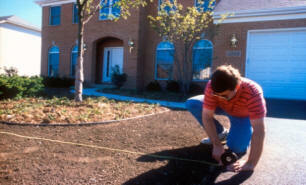 To measure area for turf, multiply length by width to get square feet. For triangles, multiply length by width and divide by 2 to get square feet. Use the “as-built” survey of your lot, if you have it, for dimensions. You can also use Google Earth to draw polygons on your property to estimate area. You can get a rough idea by measuring your stride, and counting steps between points. Alaska Mill & Feed recommends 15-10-20 1% iron as their fall fertilizer, currently $15.99 for 25 lbs. 5 lbs. per 1,000 square feet is close to our application rate. Other products are also available, including 16-16-16, which would also be a good choice, but iron seems to help. As always, we recommend a soil test in the spring to know what fertilizer and lime you really need. There are many opinions about how long to mow turfgrass before for winter. We keep it about 2″, but it all depends on your soil, location, shade, sun, and other conditions. The UAF Cooperative Extension Service is a good source for any information you might need along with the research to back it up: click here for their contact information. How should I prepare an area for installation and then lay the sod? 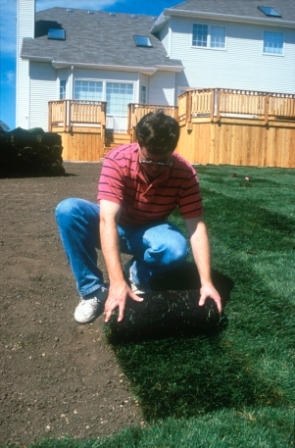 For best results, sod needs 4″ to 6″ of topsoil. Compacted soils are too hard to allow roots to penetrate, and loose soil makes an uneven lawn: a firm bed of soil that you can walk across without leaving deep footprints is a good firmness. Around walkways, driveways, or other borders, make sure to bring the surface of the soil to around 3/4″ below the border: that way, when you lay the sod, the surfaces will be level & won’t pose a tripping hazard. If your previous lawn struggled or died, the best practice is to find out why and correct the problem before you buy sod. See a fertilizer retailer or the University of Alaska Cooperative Extension Service for recommendations. Sod is best laid in a brick pattern. Be sure not to overlap the edges of adjacent pieces: this will result in an uneven surface. Snug the pieces together firmly, and you’ll have a smooth lawn that doesn’t show seams. Our big rolls, 2′ by 50′, have less seams and install quickly: roll them out in the same direction each time for best results. Soil testing is recommended to bring pH and fertility to optimum levels. Grass killed by animal urine will likely need to be replaced. Place a new piece of sod over the affected area and cut out the outline with a serrated knife or flat shovel. Dig up the affected area about 3 inches deep and replace with new soil leaving room for the new sod to match the surrounding area. Place the new sod and water to re-hydrate. What are turfgrass, turfgrass sod, sod, turf, and grass? They’re all the same thing! Turfgrass sod, the full name of what we call sod, is a thin sheet of soil, roots, and grass plants that you can transplant just by laying it out on a prepared surface. What type of turf sod do you sell? Country Gardens sells Nugget/Kenai Kentucky Bluegrass for lawn grass. It’s a native variety cultivated for its beautiful dark green color and hardiness in cold weather. 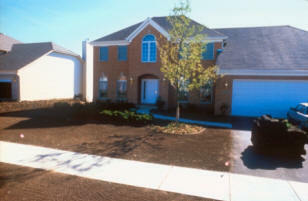 We sometimes have substandard sod available at reduced prices. Just call and ask for B-grade sod if you don’t mind the occasional clover or timothy plant. We also have forage sod for erosion control, available at reduced cost. How old is your sod? Our turf is usually 3rd year sod when you buy it: this means it has a strong, healthy root system that’s ready for a new home and won’t tear apart during harvesting or installation. 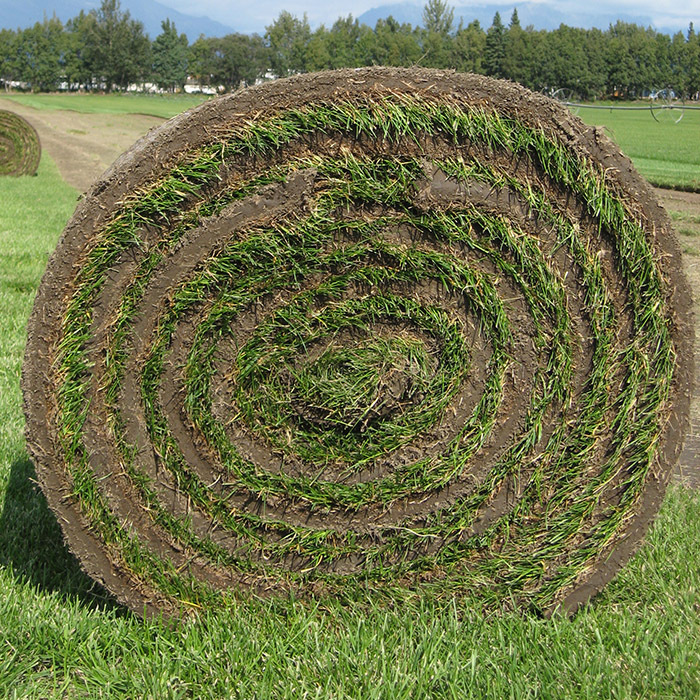 Sod is sold in various size rolls and priced by the square foot. 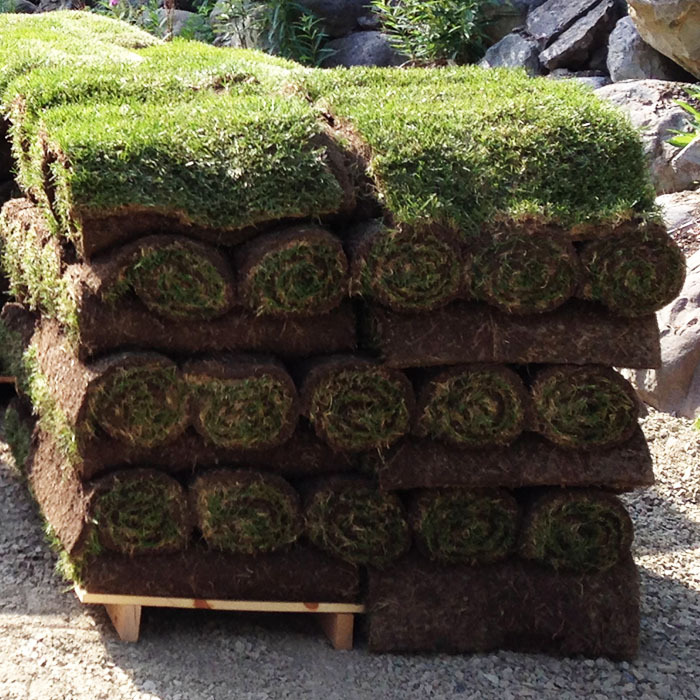 We sell our traditional small rolls of sod that are 2′ by 5′, or 10 square feet each. Rolls weigh approximately 50 lbs. each, depending on moisture level, and come on pallets: each pallet with 50 rolls weighs 2000-2500 lbs. You do not have to buy a full pallet. Large rolls are cut 2′ wide by 50′ feet long (100 sq. ft.). Each roll weighs approx. 500 lbs. and is not normally shipped with a pallet. You can cut large rolls into smaller pieces for easy handling. Sod is generally available from late May through Labor Day weekend depending on weather and demand. We often sell sod into September for late ending construction. We don’t usually run out of sod, but if you have a very large project, please contact us right away so that we can plan for your order. See pricing above or call. Please call if you need a specific quote. Help! My dog tore up my yard, I have brown circles everywhere, and I need to patch some areas. Our sod is perfect for patching. Simply contact us with the approximate area of sod you’ll need or stop by one of our sales locations to pick up a few rolls. When you get home, dig out the affected areas with a flat shovel about an inch deep with straight sides, lay the sod over the hole, cut the sod with a serrated knife to create a patch, and water your newly-placed sod generously. The patch should root down within 10 days to 2 weeks: keep the offending dog off the area while the roots form, and your grass should be good as new. If dog urine killed your grass, be sure to sprinkle some lime on the soil before you place the sod to correct the acidic pH. Will the new sod match my existing lawn? Your lawn may have grasses other than Nugget/Kenai Kentucky Bluegrass, but if you water and fertilize them alike, usually the color will be very similar: a beautiful dark green. Where do I order or pick up sod? 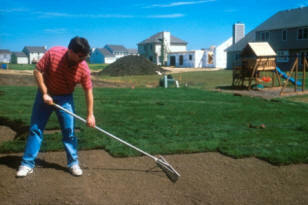 You can order sod by calling Country Gardens at 344-2088 in Anchorage, 745-0800 in the Valley or contact us online. To load your vehicle at the site, be prepared to tie down your load. Cover sod if possible. Rolls can shift when a truck or trailer moves. How long can I keep sod before laying it? For best results, install sod immediately. Usually two or three days will not hurt. Large rolls will deteriorate more quickly. 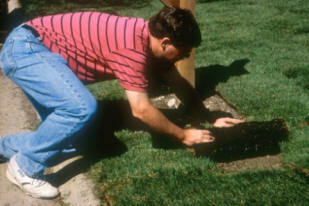 If you can’t install sod right away, lay it out in a single layer and keep it moist. Without soil to support it, sod can get dried out, but it’ll stay alive if it has water, air, and sunlight. What about putting sod on a hill? Unroll sod onto prepared area, staggering joints. On hillsides, lay sod horizontally or crosswise, and stake with lathe (cut stakes off below surface to prevent injuries) or turf staples. How should I maintain my new lawn? Soak sod well with water when first installed but do not make soil muddy. Then water like an established lawn. 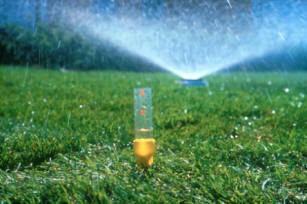 When watering new sod on a hillside, do not let water run unattended or soil and sod may slide downhill. Be sure to keep dogs or other digging animals off until the grass is well rooted. Fertilize with 16-16-16 or 22-11-11 or as recommended by soil test. 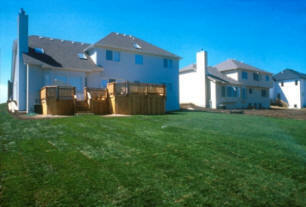 If new sod needs to match existing lawn, fertilize and water both established and new lawn similarly. When should I mow the sod? Mow sod as soon as it is needed. 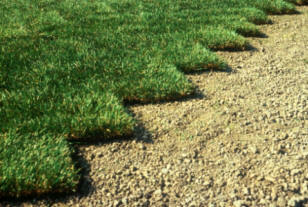 To mow new sod that has not rooted down, throttle down or raise mower blades to prevent pulling up the edges of the sod. Do you install sod? How much would it cost to sod my yard? We’re currently too busy growing our crops to install sod for you, but we love to teach people to estimate for their own landscaping projects and install their own grass. Shop around for sod installers: we sell to contractors and homeowners at the same price, so you can estimate the cost of materials using our price guide. 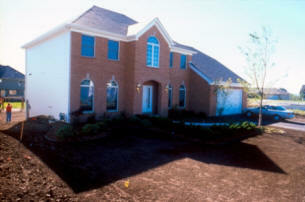 With a survey or scale drawing of the property, you can find the square feet that you want to cover with sod. Multiply the square feet by the price per square foot , add the cost of soil, compost, or other amendments, and add any delivery costs to get the project total. 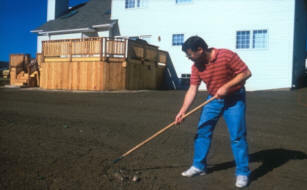 Sod installation doesn’t require any special tools: we can show you how to prepare soil and lay sod at our office, at the South Anchorage Farmers’ Market, or by phone. My neighbor’s dandelions and clover have moved over into my yard! How do I get rid of these weeds? 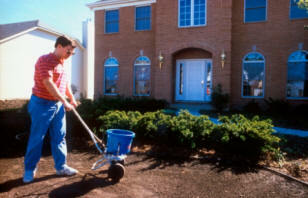 There will always be weeds, especially if weeds are not removed from existing lawn or subsoil. Check with the Cooperative Extension service to find out more about Integrated Pest Management, a great way to keep weeds out of your yard and enjoy a healthier lawn and landscape. IPM may include herbicides for those nasty weeds you can’t eradicate but also helps you improve your soil and use organic or biological controls to reduce pest problems. Of course you can pull the weeds as well! If you have more than just dandelions and clover, be sure to report any unusual or invasive plants to help keep Alaska pristine. Visit weedwar.org for more information or check with your local Extension Service agent. How can I make my sod level? Carry a bucket of loose dirt to fill edges when laying the sod. This will help it meet driveways evenly and lay flat. Open by appointment. Please call 907-745-0800. Directions: Our hay barn is located on the west side of the Glenn Highway, across from Mat Valley Milling. Please be cautious when looking up our location online as not all websites have our updated information. Directions: Do not turn on Outer Springer Loop from the Glenn Highway. Do turn east from the Glenn Highway on Inner Springer Loop, and you'll find our farm about 2 miles on the left. Open Saturdays starting May 25 from 9am till 2pm or until sold out. Directions, dates, times and details about this new market coming soon! Hay Barn: 2324 Glenn Hwy in Palmer, open by appointment only. Raspberry Road Office: 2324 Glenn Hwy in Palmer, open by appointment only.